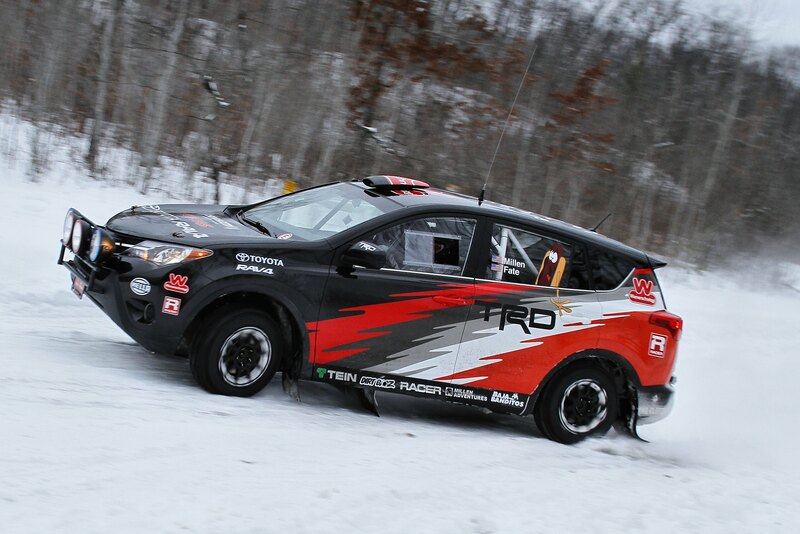 Results from Day 1 of Sno*Drift National Rally show what we all typically expect from the slippery snowy event. Staying on the road and out of the snowbanks is key, as is using the right tire, especially since studs are not allowed. 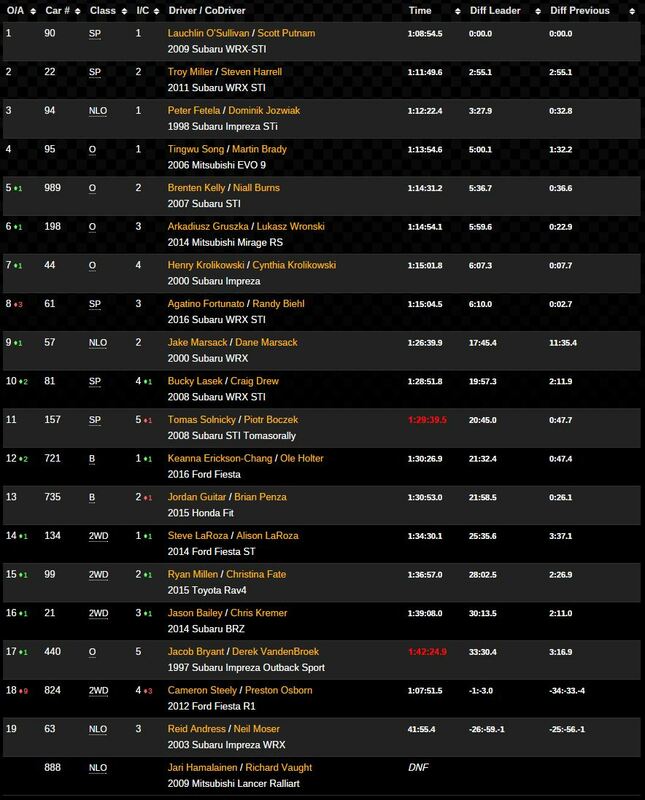 Top seed SP driver Lauchlin O’Sullivan and co-driver Scott Putnam used their advantageous first on road position to good use and lead the overall standings by almost 3 minutes. 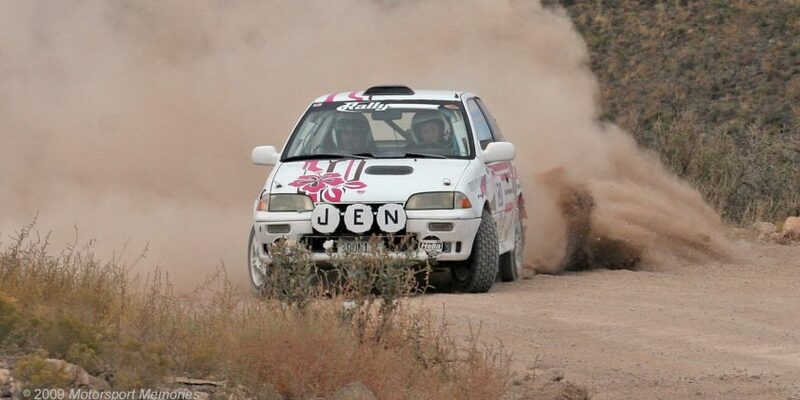 Last year’s 2WD champion Troy Miller has moved to SP class and has a new co-driver in Steven Harrell. Although Miller’s dealing with the challenges of a twice as heavy Subaru vs. his 2WD Fiesta R2 he sits in 2nd overall with National Limited Open class driver, “The Cheerful Pol”, Piotr Fetela is in 3rd 30 seconds behind Miller. With O’Sullivan and Miller topping the overall and leading SP, you have to look a bit farther down the order to find the rest of the Super Production field. In Super 3rd position 3:14.9 behind Miller/Harrell and 8th overall are a new Super Production entry for the 2016 Rally America National Championship, Agatino Fortunato and co-driver Randy Biehl of the All Fours Rally Team. “Tino” is the first to take full advantage of Subaru’s new 2016 contingency program and is driving a newly built 2016 Subaru WRX STI. A podium finish for this team will be a huge win, not just as a confidence builder, but financially as well. In 2WD it’s even more interesting as Cameron Steely brought his R1 Fiesta instead of the turbo charged ST variant he also competes in. 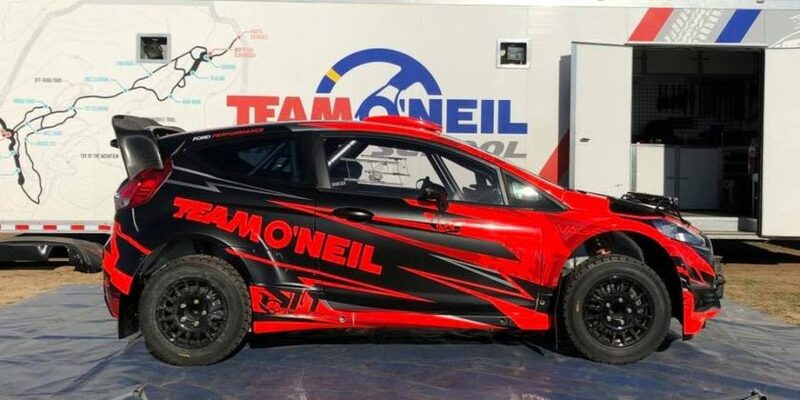 He told Rally America Radio that it was an intentional choice as slippery conditions that are especially difficult for 2WD benefits from the lower horsepower R1 as you get less wheel spin. That proved to be true as he lead the 2WD field by multiple minutes, but unfortunately something happened on SS6 the final stage of the night as he appears to have lost over 30 minutes. If it isn’t a timing problem then it now appears newcomer Keanna Erickson-Chang and co-driver Ole Holter are leading the 2WD in an even more basic B-Spec version of the Fiesta R1 by 26.1 seconds. 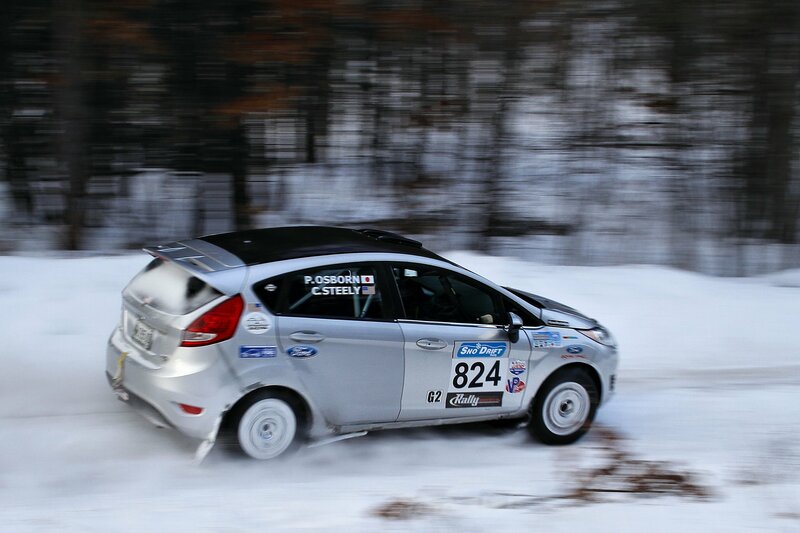 Erickson-Chang told Rally America Radio that although she has limited stage rally experience, she has done a bit of ice driving which has proved helpful. She also said that she plans on competing in the entire national championship this year, so look out boys, Keanna is already showing that she has the chops to be competitive! EDIT: Cameron Steely and Preston Osborn were able to Super-Rally and therefore continue into Day 2 with only a 5 minute penalty. This means Steely still holds the lead. Additionally it appears Keanna Erickson-Chang’s SS6 time is in error as I don’t think her B-Spec Fiesta was 2nd fastest overall behind O’Sullivan in SP. 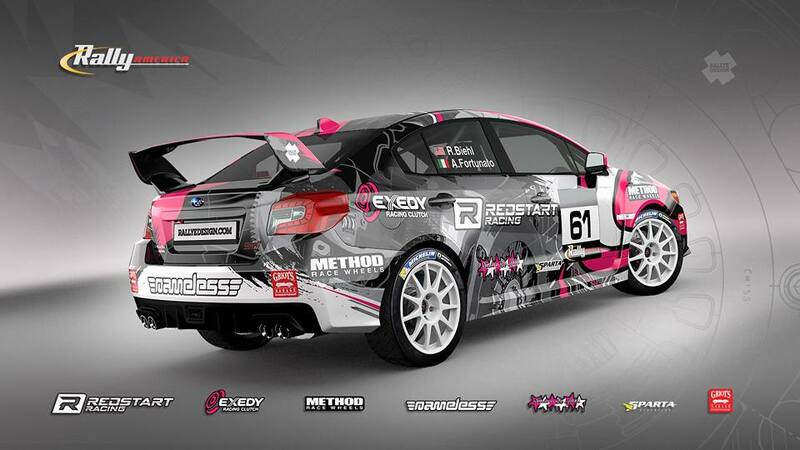 Hopefully the times will be sorted on Rally America soon. Once again the Honda Performance Development B-Spec Honda Fit is proving that they can be competitive in 2WD with Jordan Guitar and co-driver Brian Penza in 2nd going into the final day by 3:37 over Steve LaRoza and co-driver daughter Alison LaRoza in 3rd. The new 2WD Rally RAV4 project driven by Ryan Millen is a further 2:26 behind LaRoza, but has been quickly clawing back time after being stuck in a snowbank on the SS2. At their current pace, Millen could end up leading 2WD by the end of Saturday, but pushing too hard at Sno*Drift can lead to more mistakes. Other notables Brenten Kelly and Niall Burns who impressed at first, until they broke an axle on the first loop. The Michigan native who’s essentially rallying in his backyard should be able to start clawing back time on many of the front runners. 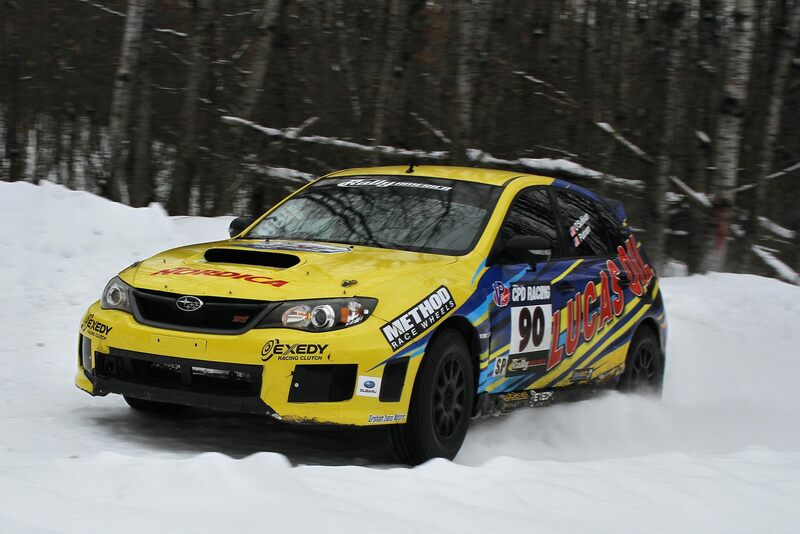 Bucky Lasek in the Subaru Parts.com Vermont Sportscar entry had his issues with snowbanks as well. Although him and co-driver Craig Drew started off well, a misheard pacenote on SS5 had them stuck in a snow bank where they spent 45 minutes digging themselves out before someone gave them a yank. Keep in mind that Sno*Drift is anything but a normal rally. Positions that are separated by minutes at other events would mean a driver can relax and preserve their position. Not at Sno*Drift where being stuck for many minutes in a snowbank or a puncture and change everything. Eleven stages remain today, including 2 runs through a Super Special Stage that we will hopefully get live radio coverage from. Be sure to follow Rally America for results and listen to Rally America Radio hosted by Jim Beaver for the Super Special and the latest interviews of top drivers in the service park.